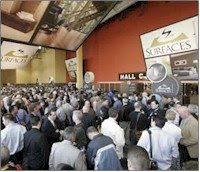 I just returned from Surfaces 2008 (Floor covering dealers and manufacturers annual convention). Because of the state of the economy and housing market, it was not nearly as crowded as in previous years. But all in all, I have to say that it was one of the better shows I have attended. Lots of new products, updating of some older dependable ones and an exciting new brand. It was not possible to see every new entry. Previously I had made appointments with some of my major suppliers to see their new wares and to take advantage of some market specials. Mannington Mills was quite hospitable. 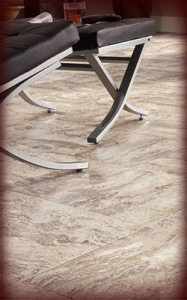 There were some new additons to their Mannington Adura Tile and Plank line and a great market special. I bought a truckload. 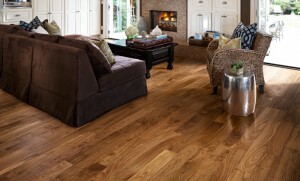 Mannington Laminate Floors and Mannington Hardwood Floors had some beautiful new additions. Mannington and the R A Siegel Company (my distributor for Mannington) gave me $100 in chips for my visit which I promptly turned into $300 while walking back through The Venetian Hotel casino. But the most exciting part of the show for me was the introduction of “Bliss“. A new carpet brand by Beaulieu USA (one of my major partners). I will give you more info on Bliss in my next post. Southeastern Freight Lines Honors ACWGWhat is Bliss by Beaulieu™?